From working with families I oberserved many times the positive, healing and nurturing aspect of doing art together as a family. Sometimes we adults can get shy or feel embarrassed when it comes to creating stuff. For some of us it might bring back childhood memories when we actually loved being creative but were told that we aren’t good at it. For some parents/adults making art is like making peace with their inner child. It’s is also a great tool when it comes to reflecting on your own parenting and on how we communicate. Oh Art! is born from the idea and conviction that we need a change, we need to make a profound social change. The more I spend time with children, the more I am drawn to believe that childhood is about developing social and emotional skills, the most important thing in our lives. Play provides it all for the child. It is their way to learn, their way to heal, their way of making connections with others and their way of understanding the world around them. Art is simply self-expression and it is also a medium to connect with one-self, with others, a chance to share ideas, a chance to innovate, a platform to address important issues in our communities and our world. I believe we have more than enough evidence about why play matters and why creativity matters. There has been so many effective approaches to cultivating creativity in children, and it saddens me deeply, that none of these approaches are put into practise effectively in schools. The arts curriculum in the majority of mainstream schools is limited. On the other hand, I feel the majority of schooled children that come to Oh Art! develop a sense of belonging within the group and they feel amazed by the freedom they have to explore what they want to explore, in their terms and at their pace, giving them a sense of autonomy. The way I provide this for the children is first working in smaller groups. This way I am able to model positive social behaviour, positive communication skills, nurture their own creativity, help them develop their own methodologies, help them understand their creative process and their needs, guide them how to work collaboratively in groups, meet all their emotional needs, encourage risk, facilitate critical thinking and problem-solving skills. All this side of the learning experience goes “under the radar” for them, as I focus on delivering all this through kindness, playfulness, empathy, compassion, active listening, asking them questions about their explorations and having fun with them. Non-Violent Communication and my training as a Positive Discipline Parent Educator have given me the most effective practical tools to establish healthy relationships with all my children (I call them “my children”, even though they are not, but I believe that a horizontal relationship between teacher and student is very necessary for the learning to unfold both ways -I learn a great deal from them too). I am convinced, as Rita Pierson (bless her soul! ), puts it: “Kids won’t learn from people they don’t like”. They will learn when they feel loved, cared for, listened to and when they emotionally contained. The love I feel for these wonderful children, as well as my own child, fulfils my heart to many levels I can’t described. I feel like I’m part of their lives as well they are part of mine. Another important point, apart from all I mentioned above, is offering high quality materials to explore and access to useful resources such as books and the internet -we need to use all the tools we have! I want the children to learn how to pursue their dreams, feel proud of who they are and live a good and successful life (successful doesn’t mean earning tons money!, but being happy and content). In the world we live in, I feel the responsibility for educating children for their future. We need more young people who can make a positive change in our society, contribute to their own lives as well as others, be satisfied with what they do, embrace their uniqueness, share that uniqueness with others, have the tools to make this world a better place. I feel very strongly that we need to invest in our children. Parents are also part of this learning process. What I love most about this experience is the bridge we, both me and the parents, build together with a profound respect for each other’s role in their children’s lives and a profound trust that their children are in a safe, loving environment. We (parents and I) have an open communication channel. 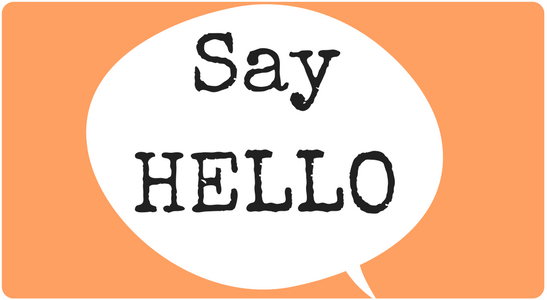 Parents feel free to talk to me about their concerns, specific issues, problems at home, problems at school, and I truly appreciate their honesty because it gives me a better sense on how to meet their emotional needs while in the sessions. If I sense something is “wrong” I also communicate with the parents, so we can find the best strategy to support the child. We are a team, working together to educate their children. Parents also learn ways to nurture their children’s creativity, learn to support their interests, learn useful tools to communicate with them, learn how to encourage them and the most delightful thing I’ve witnessed is that they reconnect with their playful self. At the end, we are a bunch of “kids” having fun, learning from each other, laughing and celebrating each other’s achievements in the making. During the sessions, we are open to talk about feelings, about situations, about ideas, about problems. ALL OF US make the space a unique space for each other, a special place where we can play, express, share and love, without anyone judging and telling us what and how to do what we love to do. This is for me the most rewarding experience I’ve ever had. Kiki trained as a Graphic Designer in Florence, Italy before coming to England to study BA (Hons) Fine Arts at Byam Shaw Art School at Central St. Martins, London. She was a founding member of small democratic primary school in SE London. She has been featured as a homepreneur in Sainsbury’s Magazine March 2015 edition. She has contributed to a number of events and workshops such as STEAM Co/Curious Minds, West Dulwich Spring Fair, and EscueLab (Madrid). Teaching Art, Visual Design and Emotional Intelligence to kids is her passion. She’s been running successful workshops for children of all ages focusing on facilitating and mentoring her students. She has done a introductory course on Positive Psychology and has a foundation level in NVC (Non-Violent Communication). Categories: Creative Stuff, Guest Posts, Relationships | Tags: art and families, art workshops for children, creative dad, Kiki Atias, oh art!, self-directed learning | Permalink. Do you know those days when it’s never gets really light? The sun can’t make it through the thick soup of clouds and mist and you wonder all day whether it’s still early morning or already early evening. This and a disgusting combination of icy rain, hail or sleet. You crave for some energy- and Vitamin-D-giving sunlight and it doesn’t matter how many oranges, lemons or pineapples you eat, you feel just low. Well, that’s how life treated me last week. So, the nice winter days are awesome. Bring them on, now. I wouldn’t mind. Then I could just grab the kids and we could spend all afternoon outside making snowmen or having snowball fights. But the other side of the cold season, the dark and miserable one, can go away. Because I’ve noticed how this darkness effects my children as well (yes, I have no idea how parents and children in Finland or Sweden survive their long winters). Sometimes it can turn a bit funny, especially when my 3-year-old informs me at breakfast “Oh, it’s time for bed. Dark outside!”. But at other times they just pick up on the weather and become grumpy and miserable. So do I. That bad mood expresses itself in tantrums (yep, that’s me included), boredom, arguments or the kids decide to burn their energy by strangling each other (gosh, did I say that?). Or they demand permanent entertainment, e.g. reading books (no, not only a couple of books, a dozen at least). Many parents might think ‘well, just turn the telly on. That’s what it’s for. Right?’ Nope. Wrong. Firstly we don’t have one (yes, you’ve heard right: we do not own a television. And yes, we are fine). And secondly I don’t wanna kill my kids’ creativity and my own sanity by turning them into fast-food-entertainment-junkies, who then believe they must buy every single commercialised product they would see on TV. Forget it. So, in order to stay calm and relaxed about such grim winter days, I came up with a list of things you and your children can enjoy. Personally I printed my list and I keep it visible as my personal back-up plan when I feel the need for pulling a little joker from my sleeve. -Invent a new evening meal: Who cares for cookery books? Especially when your kids aren’t able to read yet. So, create something new in your kitchen by raiding the cupboard and fridge. See what your kids come up with and invent a brand new recipe. Let your children help. They can chop veggies or beat some eggs. As you don’t stick to any measurements, it really doesn’t matter whether it’s too sticky, runny or hard. Again, maybe agree on some rules (“Yes, only one teaspoon of salt.”) The result could be more than inspiring. It actually could be quite yummy. If it’s not edible (never happened here… ok, well, maybe once or twice), your kids might get hooked in trying it again. Wow, lessons for life. – Have a good sort-through: Gosh, how much stuff do we need actually? The answer is always the same: less than we think. But cleaning or decluttering aren’t fun. Well, you would think so. The thing is, you can make them fun. Yep, it doesn’t help much when you shout with a grumpy face “For goodness sake, clean your bedroom now or I’ll scream my head off.” Have you ever tried to turn the ugly cleaning into a little party? Get the vacuum cleaner out, turn the music up and invite your kids to a dance. The dishcloth becomes a magic towel and everyone home joins in the who-can-pick-up-the-most-books-and-toys-and-puts-them-away-in-three-minutes-race. Everyone is a winner. Make a pile of toys and things you and no-one else in your home need. Take the stuff to the charity shop or give it away. After the cleaning party you settle on the sofa with a nice mug of tea or coffee. Awesome. -Last one: No snow but frosty cold nights? Make an ice ornament. What you need is a plastic plate or an old Frisbee disk. Collect some natural objects (leaves, sticks, feathers) and let your kids arrange them on that plate or disk. Add some water and leave overnight. Next morning you’ll be surprised! Promised! So, I hope I got you inspired. Give it a try and tell me what works for you. Share it here or on the facebook site. Need more input? Have a read here. And here. Categories: Creative Stuff, Parenting and Empathic Fathers | Tags: authentic dad, creative dad, creative winter fun, decluttering, empathy, fathers, gentle parenting, ice ornaments, long winter days, modern dad, roughhousing | Permalink. It’s one of the wholiest things you can get for a true German Christmas celebration. Forget Bratwurst. Let cool down your Gluehwein (Mulled wine). Skip the Bretzels and Lebkuchen. It’s showtime for the unique, special, fabby-do German Christmas Bread – or The Stollen. 1. Get all the currants and sultanas (or raisins) and put them into a bowl. Open the rum (have a small taster to check whether it’s a good one), warm it up (don’t boil) and pour it over the dried fruits. Leave them on the side to soak. 2. Don’t shake, but mix the flour sugar, and spices, pour in the yeasty milk, and make it into a nice batter. Get a cleanish tea towel (yep, that’s always the big problem), cover the batter and leave it in a warm place for about half an hour. Then add the butter and egg. 3. Mix everything into a dough and knead for 8 to 10 minutes (nice job for the kids). Now let’s have a rest for 1 to 2 hours (have more rum) and wait for the dough to double in size. Mix the almond filling ingredients into a paste. Knead all the fruits and nuts into the dough. 4. Now roll the dough into a oval-ish shape. Form the almond paste into a long roll, put it in the centre, fold the dough over the paste, brush the edges with milk, rest for about 45 minutes. Then into the oven and let the Stollen bake for 30 minutes. 5. 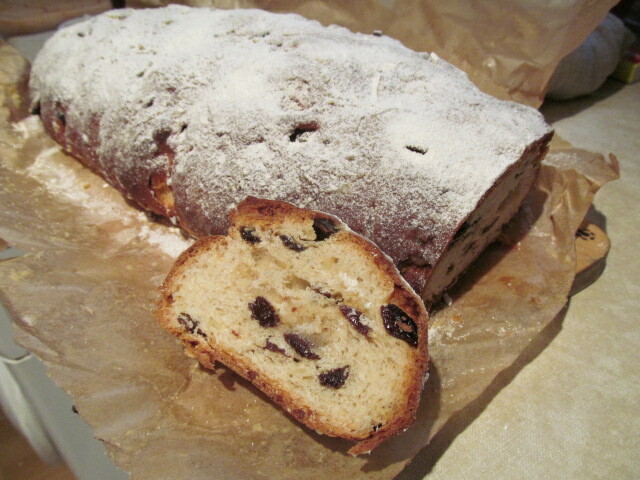 Once the Stollen has cooled down, cover it with as much icing sugar as you like. Then wrap the Stollen into cling film (or a nice clean tea towel) and put into a coldish place to rest (and don’t tell anyone where you put it). 6. After a week your Stollen is yummy and lovely and ready to eat. Some people even leave their Stollen for weeks or months before they would eat it (my father used to eat Stollen for Easter). Well, we never waited that long, it’s too tempting. So, get into your kitchen now and surprise your loved ones with something very special this year. Categories: Creative Stuff | Tags: authentic dad, Christmas stuff with kids, dads, fathers, new fathers, parenting, Stollen recipe | Permalink. Grey Autumn Weekends To Come? Get Creative! At DadsTalkCommunity I always have one common theme: creativity. Today’s post gives you an idea, how my wife’s and my creative brains get going to come up with some good ideas. This helps us a lot to keep balance and avoid arguments before they can start. 1. 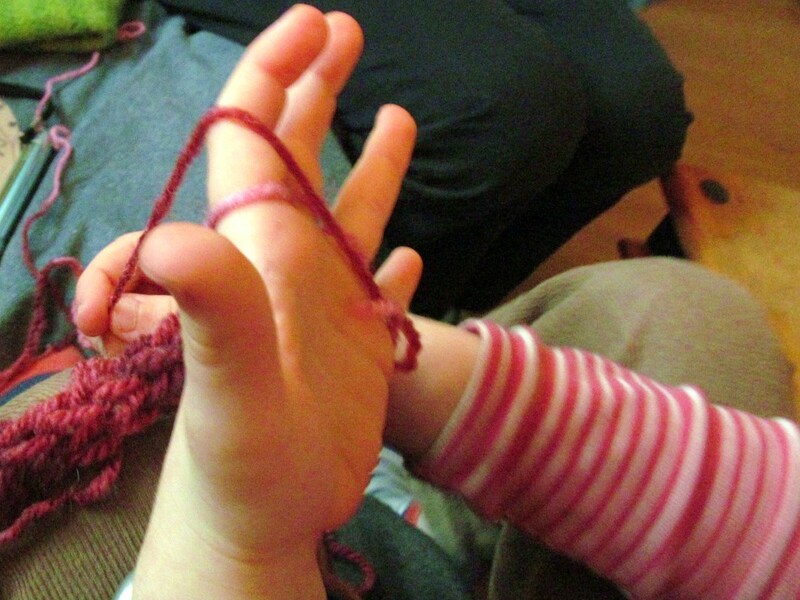 Do Something New – Have You Heard Of Finger Knitting? Well, me neither, before my 6-year-old explored it. He basically made a doll’s scarf in one afternoon. But the project isn’t finished yet. Now he wants to sew it into a hat for his doll. The great thing: It’s soooo easy to learn (did I tell you that I hate doing crafts? Well, I could change my mind, slowly). Wanna find out how to do it? Watch the easy version here (YouTube) but it will be in German (hey, you could just learn German while you knit, seriously you’ll be fine, even without a hint of German), or just type “Finger Knitting” into the search engine of your choice and get your scarf ready by Christmas; only two months to go. Do you know how much money you spend on buying bread? Yep, far too much. 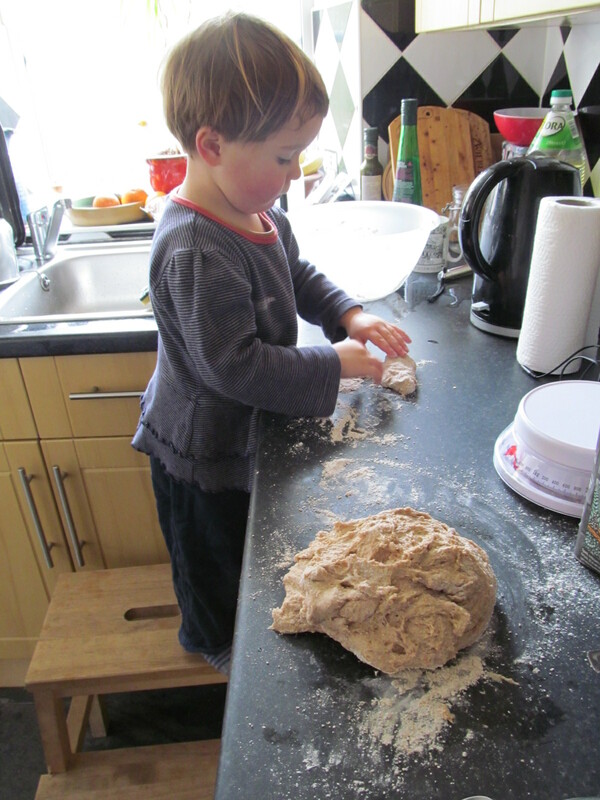 Turn it into a fun activity and let your kids burn off their energy by kneading the dough. for about 45 minutes. Now the best bit: After the loaf has cooled down a bit, EAT IT! How simple and awesome is that? Let your kids collect some sticks, bark and wood and introduce the simple concept of creating. 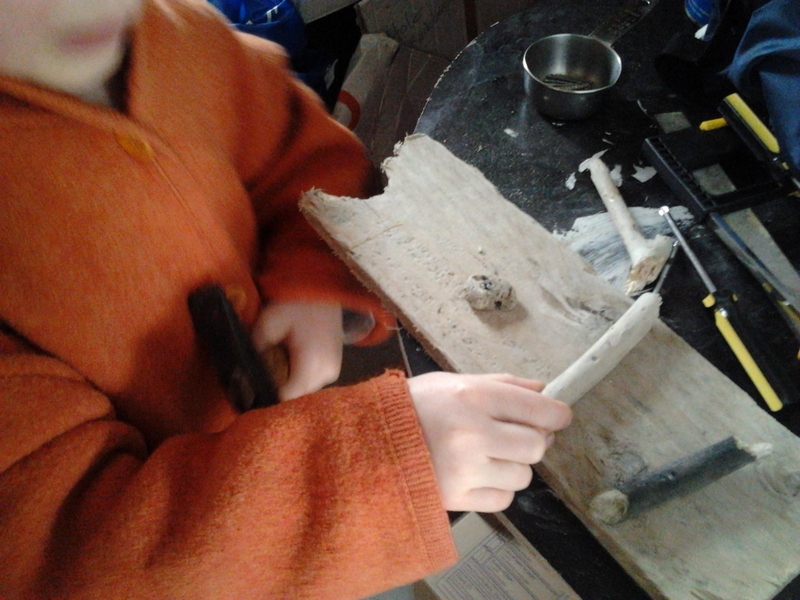 My eldest spent a whole rainy afternoon in our shed banging nails into a piece of wood. After hours of hard work (and still all fingers in the same place), he showed us his results. To us it looked like a beautiful piece of art (some stinking rich would probably pay Thousands for it) – it was and still is unique and we have found a good place for it in the house. So, hope you feel inspired and motivated. Get going and enjoy your weekend and if you like, tell me what you did or made! Categories: Creative Stuff, Parenting and Empathic Fathers | Tags: authentic dad, baking with kids, children, creative dad, dads, family, gentle parenting, modern dad, nature, parenting, play, toys, woodwork | Permalink. Your Home in Chaos? Time to Declutter! Usually once a month I get it: the declutter-my-life-and-environment-virus. Don’t worry, normally it’s not contagious. It’s like a good fever: high and short. In the way my body tells me to get rid of things in order to feel better. And often the kids’ bedroom is my target. My wife and children don’t mind, as long as they don’t have to help me in my mission. The cleaning out or let’s say – the healing process – involves: picking up all sorts of things and elements (blu tack, bits of sellotape, string, pens, books, food) from the floor; sorting the books (I think my boys own more books than me and the local library put together); dividing broken, half-broken and playable toys (yes, that’s where my eldest starts to argue: That toy is not broken, it just had an accident! ); and to make the room generally more accessible (at least for the coming hour). I find this cleaning out helps my inner peace and balance. Yes, it has something zen (please tell me if you’re Buddhist and I’m wrong). And it reminds me of the simplicity of life. When I go through all this stuff, I often think: hey, we need so little, but have so much. I don’t think my children are overloaded with toys. We really try to keep it balanced and spend a great deal outdoors in the woods or by the sea. Every time we run over fields or collect millions of stones at the beach (to make the stones and pebbles collection we already have at home just a tiny bit richer), I pause and think: yes, that’s also what parenting is about: to see and to appreciate those little things; to enjoy that very moment and to take it home. Don’t get me wrong: this is not a post saying how bad toys are. No, not at all. It’s fine for me, after spending so much time outdoors, to come back and get the train set out and play. It’s good fun and I love playing with many toys my children own (did I really say that?). At the same time I want to keep that thought of a free, running-through-the-woods, awesome childhood. Because that’s what I did when I was little. So, my children deserve the same, at least! Did you get infected now? Sorry. Should have warned you earlier. 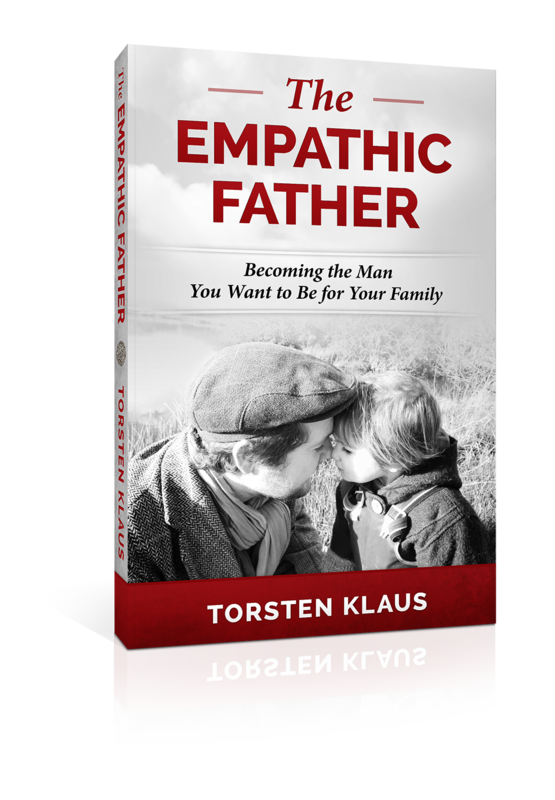 Categories: Creative Stuff, Parenting and Empathic Fathers, Relationships, Society | Tags: authentic dad, children, creative dad, decluttering, emotions, empathy, family, fathers, gentle parenting, new fathers, parenting, play, zen | Permalink.